What is the best option in a basic low cost yet professional quality spa massage table that is used infrequently? Buying online through medical supply companies is a great way to be able to find a low cost, high quality basic or deluxe massage table. Since the overhead is low through online stores the savings are passed directly to the consumers, allowing you to trade up for a more deluxe model for the same amount of money. 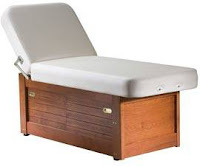 In most situations a scissor base spa massage table is less costly than a full cabinet model, which is a factor if cost alone is the major consideration. These are high quality, comfortable and very sturdy tables that are suited for any type of massage therapy room. Keep in mind that the scissor base models do not have any under table storage and do not have power outlets located on the table itself. This may need to be considered when factoring in costs of the table. Extra storage cabinets for towels, equipment and supplies can be eliminated if you select the slightly more expensive cabinet style model. What accessories are available for spa massage tables? Accessories for massage tables will vary from model to model and style to style. For many tables the first consideration for an accessory is a face crescent, which provides for patient comfort. Face crescents are not universal in their design or the way that they are attached to the table. It is important to choose a crescent that is compatible with the specific model and style of spa table that you have. Another common accessory for spa massage tables is a practical one for the therapist. Casters provide easy movement of spa tables around the room or from one room to the other. Like the face crescents, not all casters will attach to all tables so checking the model and style is essential. Typically casters are most commonly used on the scissor base models and not on the larger, heavier cabinet base options. Are there spa massage tables designed for both supine and prone positioning or are they typically for supine positioning only? 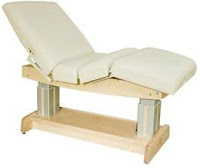 Most spa massage tables are fully adjustable for both supine and prone positioning of the patient. There are some models that are considered more practical for working with patients in the prone and supine position rather than just in a more upright or reclined type of position with the patient on his or her back.